bbPress is forum or bulletin board software that is developed by the creators of WordPress. Its purpose is to allow webmasters to easily setup and integrate discussion forums inside your WordPress.org powered self-hosted site. Similar to WordPress, bbPress is lean, easy to use, support most web standards, support add-ons for more features and is fast in performance, as well as free. But bbPress may not for everybody. After installing bbPress, you may come to realize that it does not suit your need, or your community has grown to a level that you require something more powerful and advanced. At this point of time, it’s time to uninstall and delete bbPress plugin from the WordPress, and clean up the database. By simply deactivating bbPress and delete the plugin in WordPress will not remove any of bbPress data. Unless you want to keep all the bbPress data where you may reinstall bbPress in future, you will want to completely delete and clean up the bbPress related entries in the database. Backup your database before resetting bbPress forums. Install and/or activate the bbPress plugin again if you have deactivated and/or delete it. 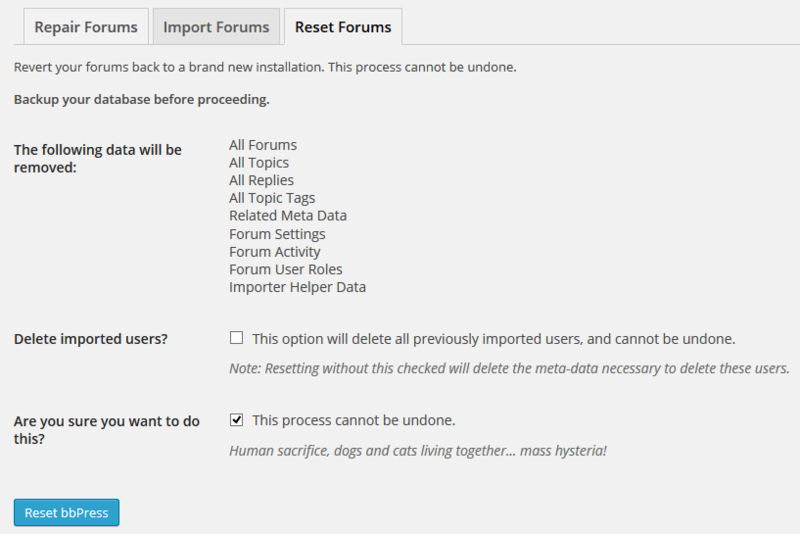 In WordPress administration panel, go to Tools -> Forums -> Reset Forums tab. Check the Are you sure you want to do this? checkbox to acknowledge that the removal process cannot be undone. You should see the various results indicating successful operations. Deleting Roles and Capabilities… Success! Note: Conversion Table is mainly used for import from other forum software. If you never imported any database, just ignore the failure. Deactivate and delete the bbPress plugin. Load your website at least once. And voila, all bbPress related user roles are now removed from database. You can safely remove the code from functions.php once done. If you have older versions of bbPress which uses separate bbPress tables with name starting with bb_, you can easily delete all bbPress data by dropping these bb_ databases.